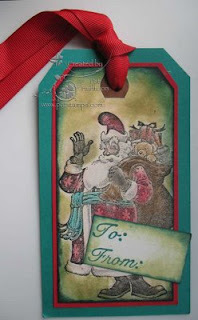 The Technostamper Sketch Challenge this week was to create a large tag. 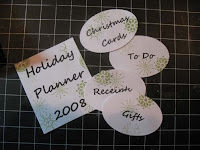 Since we are in the midst of the Holiday Blogstravaganza, I thought I would make a gift tag for one of the larger gifts I am giving this season. 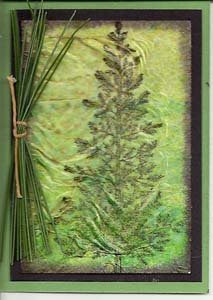 This tag uses the Burnt Edges Technique from the April 2007 issue of the Technique Junkie Newsletter. 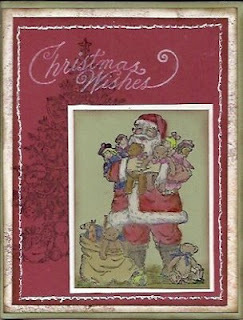 Instead of using the traditional "burnt" colors for my creation, I chose to use the greens to match my Rubberstamp Avenue Saint Nick. 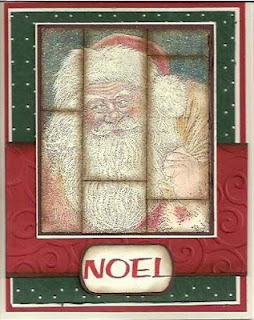 The sheet of stamps that this is one is one of my favorites this holiday season! 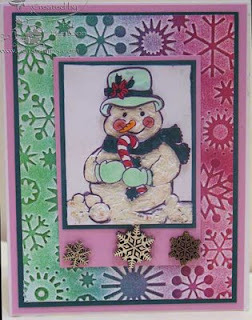 Today's card for the Holiday Blogstravaganza is this cute elf from Firecracker Designs by Pamela. 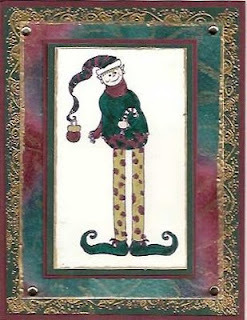 What makes this card especially cool is that the elf is layered on a piece of red and green Snakeskin Background (October 2008 Technique Junkie Newsletter) that has been rubbed with gold ink. It is a pretty effect in person! 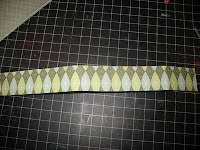 I was a bit more "swirly" with the snakeskin -- i would consider this "Swirl-skin!" Just a simple wish for a Holly Jolly Christmas! 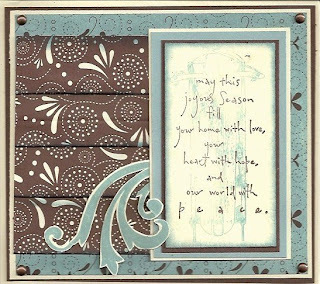 Today's Blogstravaganza Card uses the Cuttlebug Highlights Technique from the October 2008 Technique Junkie Newsletter. 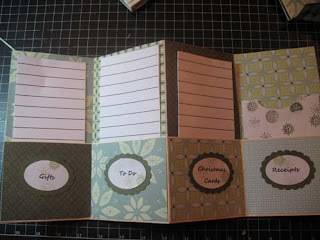 I actually used the debossed side to highlight the green leaves! The red dots are stickles -- it is sparkly in person. I just couldn't get this to photograph well...but I think it is really pretty in person. 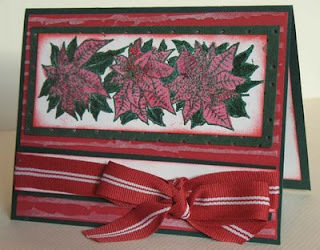 The Holly Jolly Christmas stamp is by Firecracker Designs by Pamela. 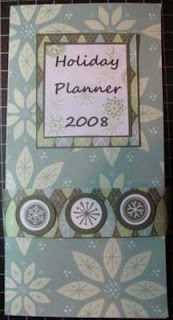 I really like this stamp -- the words are in outline form, so you can color them in to custom-match your design. 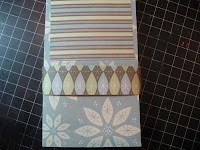 Today's Blogger's Challenge was a color challenge to use Baja Blue and Chocolate Chip, along with a little vanilla or white, on our creation. 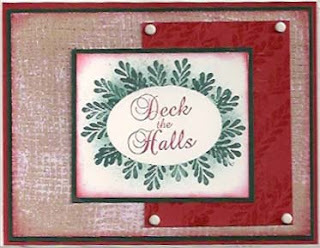 I think this is a wonderful, classic combination of colors, and they work perfectly for elegant holiday cards. That is a good thing for those of us in the midst of the TJ Holiday Blogstravaganza! 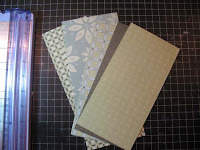 I chose to stamp the saying stamp (Penny Black) in brown over the blue sled stamp (River City Rubber). 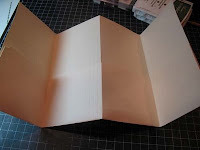 I took that mounted panel and placed it on a piece of designer paper used with the Pleated Paper Technique (Technique Junkie CD 6 Bonus Technique). 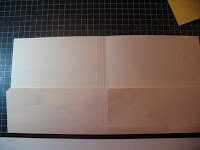 Those were layered over a piece of designer paper...that I brayered ink onto. 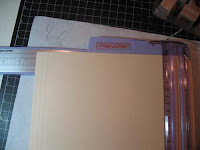 The blue designer paper started it's life as cream and brown; I wanted it blue, so I brayered it that way. I think I learned to do that from Lisa Somerville last year. Speaking of CD 6 - Nancy Judd is giving one away on her blog!! Go Enter! If you have time, click on the Blogger's Challenge logo on my sidebar to see what the other Challenge players are doing this week. Call me a goober, but one of the things I love about having a group of stamps on a sheet is mixing and matching them -- and ALSO seeing how different I can make them look from each other. Today I am doing just that. 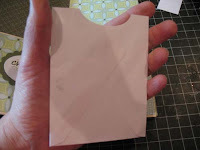 You see, this card was made from the same sheet of rubber as the card in the Giveaway Post, below, from I Brake for Stamps. Where that one is cute, this one is elegant. 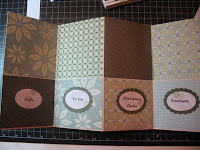 Same stamp sheet, different look and feel. Cool, huh? Okay, I know... I'm a goober. For this card I used two techniques. 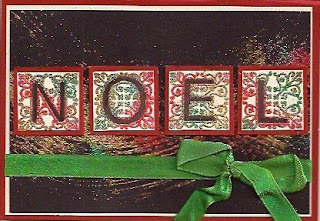 First I stamped "NOEL" in VersaMark, then used the Abstract Embossing Technique from the April 2005 issue of the Technique Junkie Newsletter to add the blaze of color. I colored the inside of the letters with a black marker, then cut and mounted them, then placed them on a background of Glimmering Waves (April 2008 TJNL), where I also used the Abstract Embossing Technique. The background was so pretty, I really had a hard time covering it up! Click on the image if you want to see it up-close. And if you have not done so already enter the giveaway (but not on THIS post, enter it on yesterday's post, here! 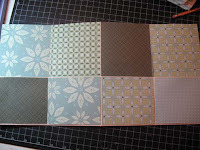 Today is Wednesday, and for our giveaway today, I have a fun stamp sheet from I Brake for Stamps. 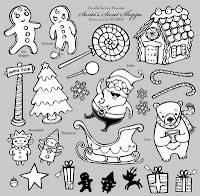 This is a great sheet -- with everything from snowmen to trees. 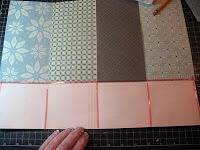 You can use these to make a wide variety of Holiday Cards! And guess what? 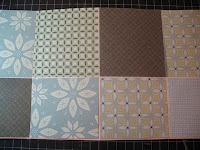 In the true generous spirit that defines Della from I Brake for Stamps, these stamps are on sale this week, too! Read on! 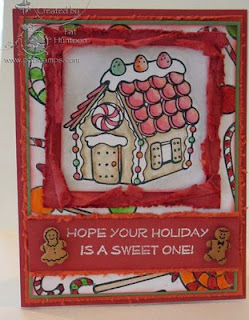 The card that you will receive with the giveaway uses the Cuttlebug Rainbow Technique for the background (the tutorial for that can be found HERE). 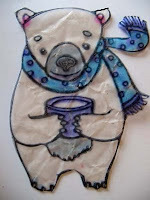 In addition, the snowman has added dimension -- his hat, gloves, scarf, cheeks, nose and the candy cane have all been popped to raise them above the Liquid Applique I used for snow. 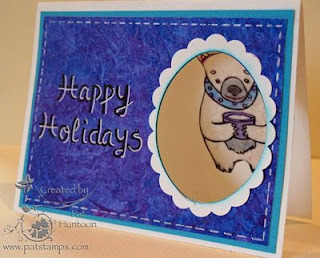 Isn't it perfect for our continuing Holiday Blogstravaganza? 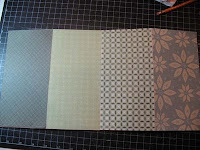 This sheet is on the I Brake for Stamps website for 20% off! In addition, TJ members can take an extra 10% with TJ discount code that the Yahoo group members have. 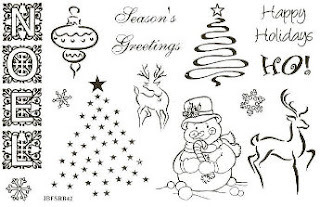 There are also more Christmas sets on sale -- you really should go take a look! I Brake for Stamps also has 6 new Humorous Seniors and a mermaid. View the all new stamps, here. Take a peek if you get a chance! One entry per person, per give away, please. To enter the give away for today, simply leave a comment on this blog entry telling me that you would like to enter by 11:59pm EST on Sunday, November 16th. No other entry methods will be included in the give away. If you email me to enter, your entry will NOT be considered a valid entry. When you leave the comment, make sure to put your NAME in the comment -- if you enter your comment as "Anonymous", I cannot give you the prize! Blogger does NOT record your email address for me, so you will need to check back to find out if you have won or include your email address in your comment so that I can notify you. A good way to do this is like so: phuntoon at optonline dot net -- it will help protect your privacy! I will have a random number generator pick one number from the comments to select one winner. Each give-away is separate, so to be eligible for a specific item you must enter that day's contest on the post where it is listed. Enter today -- good luck! 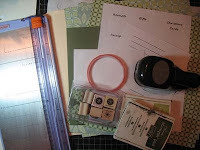 I have blog give aways every Wednesday -- come play! The winner of this giveaway is Charlene LeBel -- congratulations! 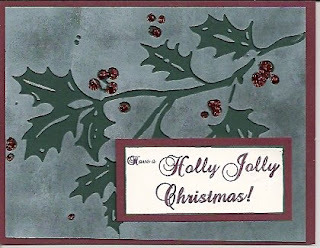 TJ Holiday Blogstravaganza -- Designers, too!